You can use garden or store potatoes to can. Our potato plants died to soon, so we did not get the crop we usually get. So when potatoes go on sale, I will buy a bunch and can them. These are our new potatoes dug this year. The small ones, I wash really good and can. These are good when it’s cold outside. The above canned potatoes are from this year. The below are from last year. The starch (the white coating on potatoes below) is just washed off, and potatoes are good. The chopped potatoes are used in : beef stew, put in a pan and fried with butter and onions, in a pan and eaten as boiled potatoes, drained over night and used in potato salad, and more. Small ones: just wash well and pack loosely in jars. Large ones: Peel and cut into a brine water ( 1 teaspoon salt to a quart of water) , then rinse and pack loosely in to jars. Then add 1 teaspoon of salt per quart and fill with water. Process 40 minutes for quarts at 15 lbs. For those of you who do not have a pressure canned, the potatoes can be froze, put in the cool part of your refrigerator. But please do not use a hot water bath canner as it is not safe. See comment #25 below on how to freeze potatoes. We have canned our potaotes for years the old fashioned way by by using boiling hot water. Peel and quarter, put potatoes in jar with 1 tbs. salt seal lids .. put in wire canner in a large pot and boiling (with boiling water ALWAYS remaining over top of lids) for 1 hour. Turn upside down and cool. There you have it! You say here that you put the jars of potatoes in a large pot of boiling water to process and not a pressure cooker is that correct? For what it is worth – According to the “official” guidelines you really should pressure can in order to kill the bacteria. There is a lot of debate on peel or no peel, pre-boil for 2 minutes or not, and use the potato water from the pre-boil or use clean hot water, but the pressure canner is important for safety. thank you for your recipe,, the old fashion way. it worked for me just great. in fact i did my beets the same way and great results (from both). thank you so much. a lot to say in “going back to basic’s” the way it was done years ago.. I canned 32 qts yesterday without putting any salt in them. I did soak them in ascorbic acid for about 5 min before beginning the process though. I filled pressure canner to top of jars and canned at 10 lbs pressure for 40 min. Every quart sealed. Am I safe from botolism? I use table salt in the potatoes and in the brine. And no, you do not have to cook the potatoes before putting them in the jars. I just wash, peel, pack LOOSELY in jars and can them. Hope this helps, if not let me know. Thank you for your response on the salt. I done just what you had said and now I have another problem. After I took my potatoes out of the pressure cooker their were some jars that like half of the brine is gone. We made sure that all the seals were on good and tight and filled all the jars the same before putting them in the canner. What happened? Can I break the seals on the jars that the brine is gone in and put more brine in them and reprosess or are they ok like they are or do I just need to go ahead and fix those to eat soon. Only had like 4 jars out of 44 jars to do this. They all look good. Thank You again for all your help. We will be praying for Tommy and your family. Your potatoes are fine. The potatoes soaked up the water and some times the water leaks out. But if they have a good seal, they are fine. Mine do the same thing, and it’s ok. And great job, 44 jars is alot of peeling. Thank you very much for your prayers. I had the same problem of lost liquid in my jars and the reason for this was I did not let the pressure on the canner go down on its own…. I had to let it set for an hour and 15 min. before the pressure reduced on its own before I took the jiggler off…. Hope this helps……. I had always heard you could can potatoes, but I have never tried to do them. This year my brother gave me a good supply of potatoes and since it is just my husband and me know I wanted to can them. How long to you process pint jars? I grew up on a dairy farm, seven kid in the family and still can a lot. My boys are grown and moved on but I still can some things for them and they love the cost savings on their food bill. I do not have a pressure cooker, so I would like to know if anyone has used the cold bath method for potatoes. Also, has anyone ever made salsa and either cold bathed or froze the salsa. Sure am glad I found this site!!! the tomatoes in the salsa are acidic. Salsa can be canned in a water bath, just as you would for tomatoes. We make salsa every year and we have both canned and frozen it. I prefer the canning as I don’t have a lot of freezer space. It is not best to cold bath the potatoes, it’s not safe. They need to be pressure canned. Can you borrow a canner from a friend? I am not sure about the salsa as we do not eat it. But hopefully one of my readers will know. And thank you for stopping by. Have a great day. For salsa you do need to pressure can it. The way I figure and advise, anything that is meat or veggies, I pressure can. Your salsa has other veggies in it, so there for to be on the safe side, pressure can it. Only my fruits and jellies/jams do I use a steam canner or water bath. Debbie, when making salsa, I use the water bath method. Just make sure you put enough water in so there is two inches of water above the lids. I process for 40 minutes after water has come to boil. Becky….I would have never guessed that you can can potatoes…..such a good idea as I don’t use very often and the bag usually goes bad. Yes, last year I cold bath canned and also froze salsa. Tomatoes are acidic so it’s safe to cold bath can. Hope this helps ya. Do you cook the potatoes before you can them or just pack them in jars and process? I have seen a few other recipes that require you to boil them for ten minutes first and then pack and process. I want to know that, can i have a shelf life of 5 days after boiling, peeling and mashing potatoes under ambient temperature i.e 34 degree celcius. What packaging material do i use for the above ?? Do i need to add some preservatives too achieve the shelf life ?? I do not cook my potatoes first. I pack them loosely in jars and then can them. And have done so for 10 + years. Yes, I too have seen those recipes and know people who boil first. But for us, when you are looking at a few 100 lbs. of potatoes, to us that’s just extra work. So I canned some with out boiling them first and it worked, and the canned potatoes lasted well over a year. So I guess it’s up to you which way you want to do it. We try and find the fastest, safest way to do things here on the farm, as there is so much to do. I hope this helps you. Maybe some of my readers will put in their thoughts on this. Hope you have a great day. Do you fill the jars with cold water or boiling water? Thanks for your wonderful tips. I’m canning for the first time and came across your site. It’s been very helpful. Gary, it is a good idea to boil lids for at least five minutes to ensure sealing. I found when I didn’t do this, half my jars did not seal. I read somewhere that the manufacturers went cheap on the sealant used on the lids. Didn’t used to have to do this. Hope this helps. I fill the jars with hot tap water. More and more people are canning now. good luck with your canning and if you have any more questions, just ask, ok. Thanks for the great information. So far I’ve put back 200+ jars of canned goods, not counting what’s in my deep freeze. I’m not done yet. Not bad for my first year. Anyway, I canned the potatoes last night, just guessing about the water. I ended up using hot tap water just like you said. My potatoes went from being white to having a yellowish gold color. My husband purchased a 50 pound bag. These were russets I believe. Is this okay? Yours still look white and I was wondering what the difference might be. Thanks again…I’m sure I’ll be visiting your blog often. Hey Becky, It’s Cammy here. I am wondering about how many pounds of store bought potatos it would take to can 7 quarts. I have been running crazily and would like to just do one canner at a time. Thanks, and by the way would this work for Sweet potatos you think? You are such a wonderful person to help out all of us “newbies” to canning. Thanks and God bless you and yours! Thanks so much for what you are doing! I have been canning for years, but have never canned potatoes–this will be a first. Your information is very helpful! Since I’m so visual, it is so wonderful to have pictures! There is nothing better on a cold January evening than to serve dinner from your own canned goods. A full cupboard of canning jars is a beautiful sight…a testimony to God’s goodness! Blessings to all! I have been canning for a few years now but this is my first year trying potatoes. 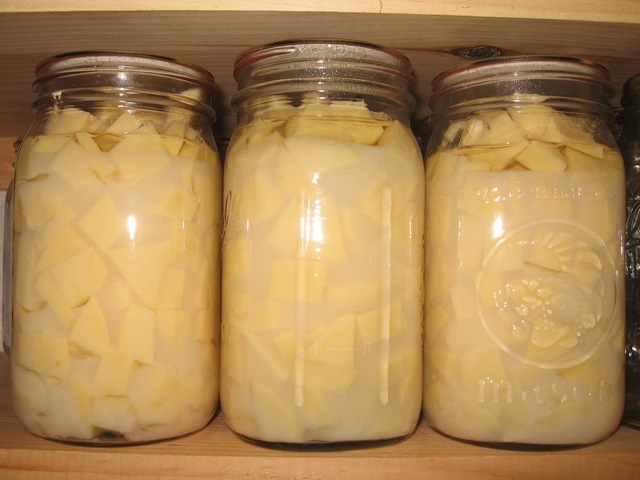 I did my first 7 quarts – used Yukon Gold and they looked beautiful when I pulled them out of the canner. When they cooled and we were putting them away, we noticed that the water had gelled – probably from the starch. Just wondering if this has happened to you and if the potatoes are still good. P.S. Love your website!! The potatoes are fine. Just wash off the gell/starch before eating/ using. It’s not harmful, I have always just washed it off. You did a wonderful job. And thank you for stopping in. I don’t have a pressure cooker, but have been processing my dill pickles and salsa in boiling water in large stainless steel pot. Can I do this for the potatoes. I have never had a problem with my other canning goods. Thanks for your time. Great website! Potatoes MUST be pressure canned. I am sorry but they must be pressure canned. It is NOT SAFE to process potatoes without a pressure cooker,they must be pressure canned. Can you borrow a pressure canner from some one? I want to can my small potatoes whole. I do not have a pressure canner. I accept your advice about not being safe to can without pressure but I was wondering if I can a few and keep the jars in the refrigerator until I am ready to use them, would that be safe. Potatoes are a low- acid food that must be pressure canned to destroy all bacteria and etc. I looked up an other way to store them safely. wash thoroughly, can peel. blanch 3- 5 mintues, depending on size. drain. cool. 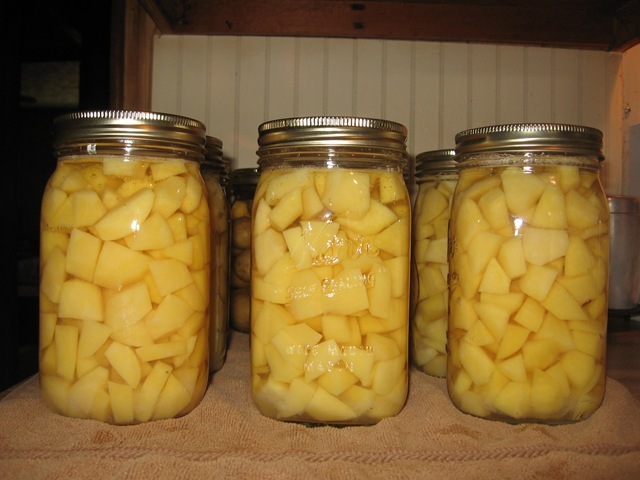 pack potatoes into can or freezer jars or plastic freezer boxes/ bags. seal, label, freeze. Or they will stay in the cool part of your refrigerator longer than out. I loved your nice pictures of canned potatoes. We have a great crop of red and also gold potatoes this year so I wanted to preserve them somehow besides just in bins. Your information is very helpful. It’s great to know that I don’t have to blanch them first. Well, I put up 20 Quarts of potatoes for the first time. Hope they come out. I tried reds, whites and russets. Also had some small onions, garlic, beans, peas and corn left from the late plantings so I did 10 quarts with some of the veggies in the potatoes. Also made a beef stock and used that as the canning liquid. Hope to have a nice soup base for this winter. Will let you know how that works out. Friend gave me a recipe for salsa, and it is the best I have ever had. If you want it, let me know. My family uses more salsa than anything else so I had to put up 68 pints. 30 hot, 20 med, and 18 mild. Well, back to preparing the garden for next year. Thank you for your help and will check back later to let you know about the soup. We are looking for some good salsa recipes. Would it be possible to get your recipes? All the recipes i have found say you have to peel the potatoes as they will produce a bacteria, but i see you can without peeling some. What are your thoughts on this? 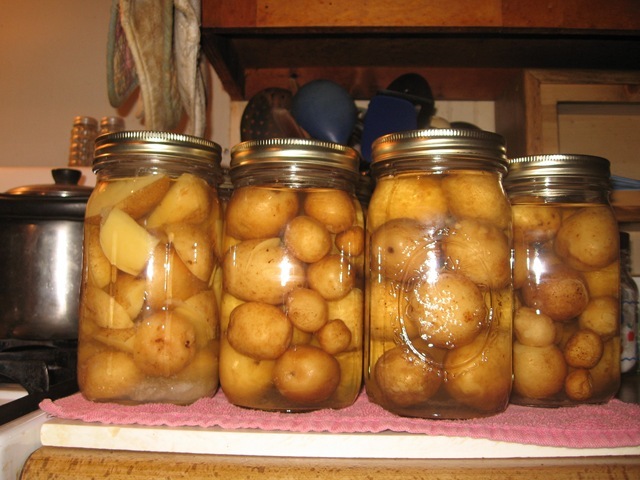 If you wash the potatoes really good first before canning, you should have no problems. I never have. Just wash them well. hope this helps. I am so glad you all like the canned potatoes. Try allowing them to drain over night after rinsing them, then deep fry them like french fries. We really like them this way. Or after draining over night – make potato salad, prefect potatoes salad every time. And thank you for letting me know about your canned potatoes. Have a wonderful fall. I, too, am reporting in that canning my red potatoes went well! Thanks for your help and insight. The tomatoes are about done and now it is on to applesauce–my favorite!! The whole house smells so wonderful! Thanks, again. You are in my prayers. Your welcome. I am so happy they turned out right for you. How did the applesauce go? I made apple butter, apple jelly, both for the first time this year. Boy, there is a lot of work in both. But I like to try some thing new every year. I started apple sauce about 4 years ago, now mine won’t even look at the store bought stuff. If I freeze my potatoes wont they go mushy when thawed out? I have never froze potatoes. I always can them. The freezing potatoes came out of the Ball canning book, for those who don’t have a pressure canner. I was giving another safe way to put up potatoes. Sorry I could not be of more help on this. Hi..this willl be my first time canning potatoes. I am very excited about it..Thanks for all your tips. Please let me know how your canning goes. i wand to can potatoes but do not want them cooked. i like to fry them later. i like them hard when i fry them. is this possible? Once the potatoes are pressure canned, they are so what hard. I fry the canned potatoes in a pan, and deep fry them, and they do not fall a part. And they are hard enough for potato salad. 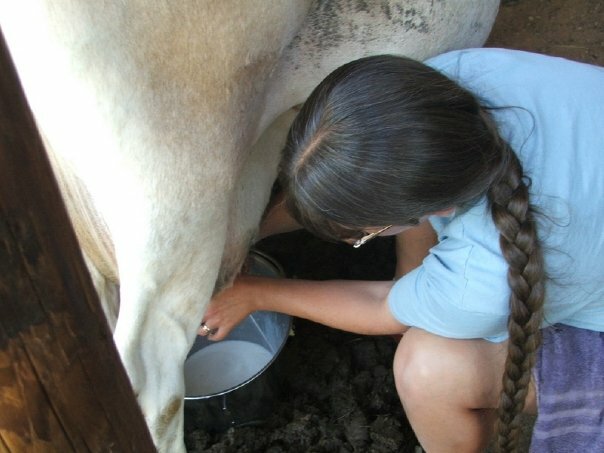 Hi Becky, love your site – love to see someone milking by hand too! We milk goats by hand, raise our children and our food here on our farm in Michigan too! God Bless you for what you are doing for our next generation. I love the blogs from you and all of your visitors about canning. I am going to do potatoes for the first time. I have been told by several people to wash them in the washing machine on gentle cycle. Ever heard of this? I was also wondering about the draining them overnight for potato salad. Do you just leave them out in a strainer at room temp, or what exactly. I got the point loud and clear about pressure canning so I wil be borrowing a pressure canner. Thanks again and prayers for Tommy and your family. Nice to meet you. Sounds like you have your hands full too in Michigan. Never heard of useing the washing machine, sorry, I just wash them by hand. Draining the potatoes for potato salad: Leave potatoes in the strainer and put potatoes and strainer in your ice box over night to drain. Happy canning, let me know how they turn out. Thank you for your prayers. It’s more like 400 -600 pounds lol of potatoes too bad you did not live by me I could give you a couple hundred. What a wonderful blessing you got. With the jars in the canner, then fill with water until the canner is half full of water. Hope this helps. Please let me know how many quarts you get? That is a lot of peeling. Happy canning. And thank you for stopping in. I know you may can potatoes w/o using salt and it won’t cause harm. This info was in my presto cooker-canner & kerr books. Only a seasoning. Definately use pressure cooker. Good luck. Potatoes have to be pressure canned. Please see if you can borrow one from someone, as this is safest way. Or see comment #25 here for freezing them and storing them. I am not sure about not adding the salt. I don’t know how safe that would be. I’m sorry I can’t answer this question for you. Maybe you can freeze him some (see comment #25 here). I am not really sure why your potatoes are soft. For I can the Yukon golds potatoes that are homegrown for years. How old were the potatoes? But I’m not even sure if age is reason. I am sorry, you have me stumped. Mine have never been soft. Could you have cooked them too long? I love your web page. I have been canning for 6 years now. This will be the first year that I try canning potato. I have alot of sweet potato (yams) to do but I don’t know how to do them. Please help. The red and white one I will start working today. This year I have put up about 300 quarts of green beans, 30 quarts and 15 pints of tomato, 34 1/2 pint of strawberry , blackberry jam plus bags in the freezer, froze 15 bags of cabbage, made sauerkraut and apple butter for the first time, froze hot and green pepers, canned hot peppers and make cabbage rolls for the freezer. I canned beets,froze turnups and dried my onions, so all I have left is these potatos. Alice, you have been busy. Boil first for about 5 min. so as the skins will rub off. Please tell me how you freeze your cabbage. Thank you for stopping in, have a wonderful weekend. I cut mine in 1/4 and blench it for 10 minutes. let it drain. pack it in bags. I like leaving it in 1/4 what way I can cut it up anyway I want when I get ready to use it. 1/4 you can use in roast, chop or shred is great in soups or fry. The secret is let it thaw and drain the water before using it. You are an amazing woman!! 300 Qts. of beans!! Thanks for the Sweet Potato idea…I’ll need to watch for sales. Becky I’m canning with large mason jar some deer meat. I can’t remember how long to cook them to seal the lids. I could use some help thank you for last time with trying to bottle some potatoes with out salt. I was reading on another website that forcing depressuring (manually letting the steam off quicker) could spoil your canned goods. Do you have any comments on this? This is my first time canning with a pressure canner. I have always did the water bath or hot pack methods. I have never heard of this. I always let the pressure cooker cool by itself. Which usually takes about an hour, I’m for safety first. Now in my 4qt.pressure cooker when I’m cooking corn on the cob in it, I do run it under cool water to cool it down faster. But I would never do it with canned foods I’m going to store. Our local market had 2 boxes of small red potatoes marked $2.00 a box. I am guessing there was at least 25lbs to a box. How could I resist. So we canned the potatoes for the first time. I cut them into 1/4s and placed them in the quarts with water and salt. Processed for 40 min after the giggle at 15lbs. Some of the bottles in each batch lost about 50% of the liquid. The potatoes looks soft and are falling apart. We had 1 jar that did not seal so we tried them for breakfast this morning and they were great fried. They were kind of like using the leftover potatoes from a roast, that kind of soft. Just think it is strange that some lose the liquid and why they seem over processed. I hope you have some ideas. Thanks for the help. opps guess that would be jiggle not giggle but that is fun too. I have canned for over 20 years..I put up around 1500 jars of food this summer and filled up 3 deep freezers..I have a large family..(expecting my tenth)..and gardening/canning is no hobby for me but a necessity! !..You should never try to “cool” your pressure canner down quickly by releasing some of the pressure…Your jars never seal in the canner until after they have cooled..by releasing the pressure you can lose some of your fluid inside the jar and can also take a significant risk of breaking your jars by decreasing the temperature too rapidly! !..I have 2 stoves and 3 pressure canners I use in the summer..and I ALWAYS just turn off the stove eye and let my canners cool on their own..Some people suggest moving them to a table or counter-top to cool off..but the least amount of jiggling the contents can break your jars!! Patience will pay in the end!!! Also, I have had tremendous luck canning sweet potatoes, but have never liked white/gold/or red potatoes after canning them..They have always been too mushy for me. Sweet potatoes however are a different story and do very well!! I’m not sure about the soft potatoes, as mine are always hard enough for potato salad. And it times some of the water comes out of my jars. And once in a while a jar will not seal, and I’m not sure why. At times I think it’s just a bad lid. What a great deal you got on the potatoes. Sorry I could not be more help. Thank you for stopping in. Have a great day. I thought I can a lot, 1500 jars is a lot. I too, fill 3 freezers. But my family is no longer that big. Now there is just 3 of us. I agree with you about cooling down the pressure cooker, as this is what I do. And Tommy loves the sweet potatoes canned. Thank you for stopping in and your comment. What is the shelf life of canned potato’s. I know mine last for a year, harvest to harvest. We have never had any left longer than that. Hope this helps. You have answered all my questions from past comments. I’m really nerves on the pressure cooking. I (My father and step mother) used my pressure cannier (canned beef) for the first time but I had my family’s help. But still nerves to do it myself. I have had a garden for 2 years now and it sure is a good feeling when the finish product is sitting on the self. My Aunt Ada would be proud of me!!! I’m putting you on my favorites so if I have any questions I know where to coming (HERE).I also stay home with my kids. The more you use the pressure canner the better you will feel. Just give it a little time. It’s the best thing you can learn to do, and will help you out the most. Please keep me updated on how you are doing with it, ok. Have a great week end. Thank you for stopping in here. I canned potatoes last year, they look great and pretty as yours! BUT…I didn’t know about the pressure cooker and just water-bathe them for 45 minutes. What do you think? Should I just discard the 20 jars of it or try them and see? I’m afraid now! I too just washed my little red potatoes, and boiled them for 10 minutes. Then placed them into a quart jar, added 1 teaspoon of salt (regular non iodized) and then put them in the boiling water and cooked them for 60 minutes. The potatoes stayed whole with the skins on, and they look pretty solid inside the quart jar. Now, I am concerned about the skins holding some bug that may prove bad to our health. Your comments please. If the potatoes were washed well before cooking, they should be fine. I have never had many problems before. If you are still concerned just make sure you boil or fry the canned potatoes before useing. But like I said if they were washed well and cooked as long as you stated, they are fine. In fact you precooked them for ten mintues before pressure cooking them.I do not pre cook mine, just pressure them. Hope this helps if you have any more questions let me know. Have a great week end. This is what I would do, but you need to do what you feel is right and safe for you. I would open a jar and smell them if they did not smell bad or look bad, I would reboil them GOOD before using/serving. Then taste one, to check taste. I am sorry I can’t just come right out and tell it’s ok, because I am not sure on this one. Trust yourself on this. I have finally finished my potatoes. 167 quart jars. It feels so good, and so reassuring. Thank you for posting this. It was exactly what I was looking for. I have almost bottled 500 jars of fruit, and veggies this year. My husband will need to have surgery on Monday for a ruptured disc in his back. I will be living on our food storage for the 6-8 weeks that he is out. It is nice to know that it is there. The reduced paycheck will only pay for bills and now I will still be able to feed my family. thank you and my thoughts and prayers are with your family. I noticed you left the red peels on do you have to peel russets or can you leave the skins on? You can,if you wash the skins VERY well. I only leave the skin on the small potatoes, as peeling them would not leave much potato. Hope this helps. I just wanted you to know you’ve inspired me – I canned 7 quarts of potatoes for the first time today. :o) I’ve canned lots of other things, but never thought about canning potatoes until I found your blog several months ago. Thank you! I have so many other things I want to try canning (cheese sauce, dried beans, etc. ), and I feel like time is running short. I really appreciate all of the information you’ve shared on your blog. It is truly so helpful! Continuing to lift you, Tommy, and your family up in prayer. You are more than welcome, I am glad to help. I have been reading your blog and you are doing a great job with everything. My best find this year was the canned cheese sauce and the clothes soap. Thank you very much for all your prayers for us. Yes, you start timing when it starts to jiggle. Hope this helps. This is excellent; I like knowing how many pounds to quarts. Thank you! Gave my wife a pressure cooker for Christmas and I ended up wanting to play with it. I thought potatoes would be a good first start. I’ve got a question if you don’t mind. I thought I’d experiment with just 15 lbs. of potatoes but ran out of time after my first batch. I’ve got the unprocessed potatoes in their jars with no water in them. Would it be alright to put them in the fridge overnight and start the process up again another day? I’m sure I need to let the jars warm up before just putting them in hot water. Will this work or should I try something else in the future? Again, this was meant as an experiment so if I need to start over, that’s fine. I am not sure about this. I always make sure I have time set aside for canning, usually a whole day. I would think that just putting jars in fridge with no water in them would turn the potatoes colors. I , myself, would not pressure can them. Maybe you could cook them for a meal, but add water so as they don’t turn colors. I really hope this helps some. Looked thru the thread and see I am not the only one concerned about the future. I have been caning Tuna for about 15 years now and have had great luck. Is it possible to can potatoes ‘dry’, with no water in the jar? Would this ‘help’ to keep the potatoe firm and not get soft? I am thinking about canning small red potatoes whole with the skin on. Do you have to peel red potatoes. and what pressure do you cook them on and for how long. Sorry it’s taken me so long. But I would use water with the potatoes. And you can leave the skin on the small ones as long as you wash them well. The small ones do not need to be peeled, just washed well. All times and how to are listed in the post above. Hi Becky: I have a question. What if I can at too high a pressure for too long a time…will it ruin my spuds or meat? Thank you for this site…your work is appreciated…my Bible here in Idaho. Best regards…Cliff. Sorry it’s taken me so long, but life happens at times. Unless you can them way to long, they should be fine. The meat might fall apart when opening jar, but it’s still safe to use as long as the jar sealed. Same with the potatoes. Both if over cooked some can still be used to eat. Hope this helps some. I am waiting for the pressure to go down in my canner. I have canned 7 quarts of potatoes earlier tonight and have 18 pints in the canner now. I think I have another 20 lbs to can tomorrow. I used red potatoes but after they were cooked they don’t look red. But I am sure they will taste great. I had picked up a 50 lb bag of red potatoes for $15.00. I have potatoes growing in my garden but I thought I would supplement my garden while the price was right. My canner gets a workout almost every weekend! Thanks for your advice…as always it was very helpful. I also would like to encourage everyone to get over your “fear” about canning. I have only been canning 4 months and I still have to think at every step but I have canned chicken (both cooked and raw packed), stew meat, hamburger, tomatoes and now potatoes. It doesn’t get any better! I am glad I found your site, we planted over 50 lb of potato this yr and I am sure we will way more than we can consume this summer. I look forward to trying my hand at canning potatoes. As one comment said of washing the potatoes in the washer. I wouldn’t have thought of that,but my mom has been washing her green beans in the washer for over 30 years now. I just wanted to say thank you for your blog! I canned my first 4 quarts of potatoes this afternoon. My husband got a 50 lbs bag free from a truck driver after he had worked on his ThermoKing unit for him and I was so worried when I pulled them out of the canner and half the liquid was gone from 2 of them! I thought I had wasted the potatoes. But now I feel so much better! Now I can go back to canning in the morning with confidence! God Bless you and your family! I’ve enjoyed reading the comments that are posted here. Picked up some very valuable tips. My husband grew some turban squash for the first time and I have no idea what to do with it. Is it possible to can it? If so what would be the process? I think I forgot to say our potatoes are the red ones. I’m not sure about the squash, sorry. Had the same problem last year with sweet potatoes, green beans. I thought it was the new jars and lids, the seemed thinner than ones I had left from the previous year. Also canned at my moms using her mother’s old canner and mine. We thought it was our canners. Mine has been warped. My son canned green beans for 2 hrs!!!!!! I have a smooth top stove, mom’s is gas. This year I purchased a new canner with a thicker bottom, still had the wrinkled lid problem but not as much. Good afternoon Ms. Becky I hope you and your family are well. I would like to can the makings of a potato soup/stew. Can potatoes be canned along with other vegetables such as onions and carrots….or beef? Yvon, a newbie at canning. before canning to keep them white ? Hello! Thank You so much for being here! We are canning for the first time and started with potatoes. We used the Ball Book and was very careful to follow all the instructions to the tee. However; when we opened the canner the white potatoes had turned yellow, and there are little bubbles in some of them like they are boiling! They are still very hot!But noone else has mentioned bubbles and we (my daughter and I)were very careful to tap and make sure all the air was clear on them before sealing them and they were so beautiful in the jar before canning them and now they are yellow? Do you have any idea why? We still had the time of our lives doing this, but are very disappointed. I was so happy to read that we did not have to pre-boil them and that they could be canned with the peals on them. No, I have not. Sorry. The potatoes are ok. The bubbles are ok. You did fine with them. When cooked they may change in color, it’s ok. I am sure there is some thing you can add to them to keep them white if you wanted too. But I like the simlpe ways, and not adding anymore than I have too to foods. Thank you both for stopping in and have a great day. Becky, I want to can our few new potatoes, but have never used a pressure canner. I borrowed my neighbors but don’t have any instructions with it. Can you tell me how much water to put in? The canner gets filled half way with water. Put all your jars in canner then fill canner half way with water. this is the first year that I’m going to try my hand at canning. I have a question on what or how do you store your veg. till you get enough to can? My Veg. are just now starting to come on & there is not enough yet to can. Any Ideals would be appreciated. Thank You & may GOD BLESS You for all the help you do for others on here!!!!!!! Do you need to use ascorbic acid when canning tators? I store vegs in a cool, dark place until I am ready to do them. For things like green beans, I can small amount in pints jars in my little canner. They are harder to store. You could freeze them in small batch, but they can not be canned after that. We do not like frozen vegs. A small canner is great, they usually hold only 4 pints. I only use table salt in my canned potatoes. Just let me know if you all have any more question, please just give me a day or twoo to answer. My husband and I started canning just last year and decided to try potatoes. We put up about 40 quarts and they didn’t last long. The whole family loved them! We have already put up 70 quarts in just the last two days and are working on getting 100. We will be canning over 400 quarts of garden vegetables and juices and loving every minute of it!!!!!!!!!!! That is wonderful. And your canned food is so much better than store bought. Keep up the great work. And enjoy. Thank you for stopping in. Have a great day. First time growing red potatoes and canning them. Do they need to be peeled or simply scrubbed off first. Hi Becky! Thanks for this wonderful source of info. I just today canned my first batch of potatoes, after being inspired by your page here. They look like those in your pictures, so I guess they turned out right! Thanks also for your vigilance in driving home the importance of using a pressure canner for low/no acid foods. There really is no safe alternative. WOW, wish I discovered this site two weeks ago. We purchased 10# white new potatoes and 60# red new potatoes at a produce auction(great price) and canned 30# (First Time Canning) by directions of both the owners manual and a canning book. Both references had us peeling those little taters and boiling for 10 min. before canning . What a pain and waste… Needless to say, the rest will be canned skin-on and without pre-boil. Got a question – any difference between using table salt or canning salt? Thanks again for great info. I would freeze the celery, but it can be canned. Check you’d canning book for times. Great job on your potatoes. They will taste wonderful this winter. I am sure sure about the salt. But I use table salt in my canning for 10 plus years. Wow- 3 days ago I canned sweet corn using the Hot Bath method and did not realize I needed to use a pressure cooker. What do you suggest I do now? Would it be OK to open the jars and eat them now, or freeze them? OR do I need to pitch them? Please advise…Thank you! Hi Becky, I’m new to your site but it’s been really helpful. We pressure canned potatoes last year and they all gelled. I can see it’s no big deal. We are about ready to harvest our Yukon Golds (that we have grown in 10 inches of pines needles. My questions are as follows … Do potatoes need to cure first before canning? Does the curing process make them harder dense)? Is it true Yukon Golds are the best to can? Thanks!! Sorry my advise is late in the coming but I would freeze the corn. And then cook them well before eatting it. I am not sure how safe they are to eat without freezing and recooking well. It’s always better to be safer than sorry. But use your judgement on them, as to if to throw them out as it has taken me many days to get back to you. Sorry again it took me so long. I have never cured my homegrown potatoes first. I dug and wash them one day and then can them the next. I have canned store bought potattes (they are cured) and they are a little harder to us but still eat-able. Yes it is my thoughts that yukon golds are the best to can. Once we found these potatoes, it’s all we grow. I have found that they are the best all around potatoes. They make great: mashed potatoes, fried, canned(the canned ones, make perfect potatoe salad everytime!) , homemade french fries. As you can tell we love our yukon gold potates. Hope this helps you. Have a great day. Yukon golds are the best buttery potatoes. You don’t have to use so much butter and sour cream because they are so flavorful! Becky, I found your site about a week ago and I love it! My kind of living, there is nothing better than country living. I used your recipe for canning potatoes. I worked too hard in the garden to let them rot away. Do you have a recipe for apple juice or cider for canning? Thanks. A friend of our family gave us instructions on canning using the oven. It worked well for our beans and peaches this year. The instructions are to put the cans in the cool oven, turn on to 240 degrees and cook for 2 hr. fruit and 4 hours veggies. Will this work for potatoes. I do not own a pressure cooker and this is the 1st year my husband and I have had a garden and we were hoping to can our potatoes. Just wondering. I know that some people are sceptical of this method, but it cooks the food throughly and then seals as it cools – seems like the same process as a pressure cooker. Thanks for you help! I have never heard of oven canning. Have you found out more about this and if it’s safe for potatoes? I have grown sweet potatoes for 35 years. I use the freezer for them. I blanch for about 5 minutes after I have washed and peeled them. I cool them down, then bag and freeze. I usually cut them up before blanching into the sizes I need for serving. I can take out of the bag just what I want for the meal and leave the rest frozen. Works every time. I’m into my second year of canning potatoes. Last year’s batch ran out in January so now I know that we will use them! New question for you: have you ever done anything with turnips and/or rutabegas? My husband, in his zealousness, planted all kinds new vegetables and I don’t know what to do this these long rows of turnips and rutabagas! Even if I don’t can them – I don’t know how to prepare them!!! How were your tomatoes this year? We had a bumper crop and I canned 3 batches a day for a week and a half! Your website is my favorite – I feel like a I have a kindred spirit in you! Thanks for all you do! God Bless! Char, this is true for years before pressure canners were even invented people canned this method for all garden veggies…but, now of days people simply don’t have time to hot bath low acid foods and pressure canning is much safer to kill bacteria. Years ago my family always hot bathed everything. Green beans, corn, and potatoes were hot bathed six to eight hours. We were know to build a fire outside and use a large galvanized tub and hot bath these veggies. Someone had to monitor the fire during the boiling bath process as to avoid slowing down the process. I personally have know entire families that died as a result of eating home canning that did not kill all the bacteria. Although, no one in my family ever got ill or died…..hot bathing low acid food and meats is risky without a pressure canner these days. Also, a lot of garden growers spray their plants with chemicals which they did not do many years ago. I did discover the hard way myself. I don’t have time to attend to a hot bath canner for several hours. Did you know that hot bath canners can not reach the designated heat needed that will kill all deadly bacterias as a pressure canner will? I also have a neighbor that still uses the out side fire and tub method to hot bath their garden veggies ..but, they also do not spray their plants with chemicals…this will play a role in the canning process. I personally do not even like buying or using garden veggies from unknown others because I don’t know if they have been sprayed with chemicals. I only can from family and friends that do not spray their veggies. I hope this info helps others to make their own decision regarding what canning methods they want to use. Thanks for sharing. Becky, I love that this conversation has been on-going for over a year! I am going to can potatoes for the first time this year and as we normally leave the skins on, that would be my preference. However, this year my potatoes have scab. Do you think I should peel them first? or would it be ok to can them with peel (even though they are ugly 😦 )? I have never had scab on my potatoes before, but I think they will be alright to eat. Thanks! Try using a scotch brite pad ( ruff side )to wash potatoes as you wash it also takes off skin of freshly dug potatoes. Becky, thanks so much for all the encouragement! we were as kids grown up,my mom always cold packed them for 4 hours and they all sealed. so thats why i didnt understand it. I canned veggies for years, as well as salsa juices and this year I tried potatoes I peeled them cut them into small chunks and put them in qt. jars 1 tsp, canning salt and tap water, sealed them and boiled them in my canner for 4 hours. They are beautiful,, no cloudiness or jell. I’m scared of pressure. We have been eating them, fried with fresh onion and mashed with home canned sauer kraut. My family never did pressure can after my aunt and I blew up a canner full of tomatoes. I drain them and cook them right away,, do not let any food sit over night. If they are sealed I’m not afraid to eat them. I am canning new potatoes this year. When you say cover the potatoes with water..should this be hot water that i have boiled on the stove? Hi Becky, What an informative site! Bless you and all the reader’s comments. I found this to be very helpful. I am canning potatoes for the very first time. I have canned for years and years, but; never potatoes. I hope they keep well. Do you have a recipe for Mild Salsa? Also for pickled green tomatoes? I would love these two recipes. Catfish Campus here in Columbia, Tn. serves them with meals. Yummy! Thanks in advance for the recipes. God Bless you and all who are so helpful. I was very interested in the comments on doing potatoes. Did a few jars last year …I par boiled them before jarring then pessure cooked them. Today i am trying the method mentioned…soak in lemon juice and pack raw potatoes then pressure cook 35 minutes. I will try only a few jars and decide if they are as firm as we like them. Will let you know. the only thing i did was wash and some i peeled others left skin on, it is easy too get off with fingers if you don’t want skin on what ever you do with them i never per cook them. have canned 72 this year also did 75 stewed tomatoes 32 carrats. 22 carrets and did 28 turnips. this year i told hubby we will not do turnips but more potatoes as i only have 2 jars left. we had to buy a tall cabinet for all the canned things and have a freezer out in shed for things like corn on cob, string beans also froze zuccine for baking and adding to other things. So I’m very new to farm life and canning, I want to can potatoes and then make mashed potatoes from them. Would I can like you have said then when I want to use them just heat them up a bit and mash like normal??? If I’m whipping them with milk and butter will they turn out slimmy like canned from the store? What kind is best to can for whipped potatoes later?? I have never pressured canned my potatoes and I have been doing it for 15 years, I just use a regular canner on top of the stove and I have never had any issues with them not turning out. So if you don’t have a pressure canner or cannot afford one then this is fine as well. Does anyone know how to pressure can ham and beans? I have done it once before but the beans turned to mush. To cook or not to cook potatoes before canning, I do them both ways but I add a few minutes to pressure canning process when I don’t cook them. I found that a bringing potatoes to a boil and then processing them cuts down on the starch build up in jar for those who don’t like the sight white crap in your jars, also the the type of potatoe has role to play in this starch build up. Boiling your potatoes before removes some of the starch on the surface of potatoes that leaches into the water as it sit on your shelf and also ensure an even cook process. It will not get rid of starch build 100% but only slows it down. Canning does have to be boring. Teach a Teen to can, good time to bond and get to know your children, do on rainy day so not to conflict with their busy lifes! Also they tend to eat their veggies better when they know they made them! Happy Health To All! Hello, this is a wonderful site! I have learned a lot. I am new at canning…yesterday I did 19 quarts of potatoes and my question is..I have a pressure cooker but I did not put the lid on while the jars were in the cooker. They boiled in the jars uncooked for 45 minutes..will this hurt them? Love the website. Have been canning for many years and cannot imagine my home without those beautiful jars of fresh, preserved food. Truly one of God’s sweetest blessings! I would encourage anyone in these tough economic times to try their hand at canning. You will not be disappointed. I canned 24 quarts on Saturday following your guidelines. I looked at the jars today -Wednesday- and in most of the jars the water is gone? Do the potatoes absorb the water and are they still ok to use? Thanks Ginny, I fried some a couple of days ago & put Velvetta cheese on top, boy were they good!!! I have a question, I canned several quarts today, and the first batch turned out with yelow orangish water, in your pics the water looks clear. Did I do something wrong? Hi. My father and I canned 111 qts. of potatoes. We peeled them all, soaked in absorbic acid(lemon juice & water), blanched for 2-5 mins., packed in jars, put boiling water in them then lids & rings.Put in pressure cooker @ 15 lbs pressure for 40 mins. Took them out, they were brown and smelled burned. AWFUL! The rest, we brought canner up to 15 lbs for a few mins then turned heat off. They look good. Since it takes a while for pressure to go down and stayed at 10-15 lbs for a while, are they ok? Please answer soon, so I know whether to throw out all this work. Love to can, but this would be very disappointing! I just canned some potatoes and the water and the potatoes are dingy colored. Any idea why? I canned potatoes last year and they were as white as they could be. When you get ready to can potatoes do you add the fruit fresh or absorbid acid to each jar or when? Hot-bath canning is not appropriate for dry storage of low acidity foods. I occasionally cheat and will hot-pot can foods but always keep those refrigerated to maintain the seal and reduce chances of bacteria growth — it does keep food longer. Also the reason why people use canning salt rather than table salt is only that table salt contains fillers (generally clays) which will cloud the canning fluids. Its fine but for potatoes which will cloud up with time anyway and the clay doesn’t hurt you — you eat it in your table salt all the time and many other processed foods (e.g., ice cream). I grew potatoes last year and some ruined before we could eat them. This year I will can some. Thank you for the info. I looked at this site listed on your site, FreeGroceryCentral.com. Do we have to use the cards at the stores listed on the cards? Example: Winn Dixie card used at Winn Dixie only. I’m assuming you have used their cards. I am canning for the first time and I do not have away to pressurize the jars shut…do you have any suggestions? Wheres the best place to buy canning jars? I buy all my jars from local Dollar stores. Cheaper.. Be careful of the seals you buy from there and Family Dollars. I find a lot of them do not seal. Great site with great info. I would do one thing differently. I never waste any thing. From the water that I boil my potatoes in, I make vegetable broth and process it as I do my potatoes. It is a great resource for soups and stews. Felicia, I remember my grandmother canning her green beans in a water bath canner, but this is one of those low acid veggies that you really must pressure can. It’s just not worth going to that much work to have them spoil….or make you and yours sick. Do you have to peal the potatoes? And what kind of potatoes is best to us? i peel some and don’t peel some and iuse yogan potatoes. First time canner here and can’t wait to can our red skin and purple (yep completely purple) so here’s my question. Do the potates have to firm to the touch or can they be a little soft? Thanks!!!! okay did my first potatoe canning and pressure canning today. Got a question??? Does the 40 min. start once you reach 15 lbs of pressure? My potatoes are not white but a goldish color……not sure why. I have canned potatoes before with success. I was at a farmer’s market today and saw canned dilled potatoes with dill,garlic ,etc. Does anyone have a recipe? The lady selling them says they have a dill pickle taste to them. What kind of potatoes do you use for canning? Is there one kind that is better than the other? I’ve heard that some kinds can get too soft when canned. I am new to the canning world and I am very excited to try new things but I have a couple of questions…I do not have a pressure cooker but I want to can potatoes….can I use the hot bath and if so for how long? Do I have to peel the potatoes or can I can them unpeeled? I also do not have a pressure and grew up on my mom’s canned potatoes that were canned in water bath and I also raised my family on canned out of the hot water bath/ (Old fashion canners) and never had a problem.. just boil long enough and cool time and you’ll will get the “PING” when they seal. Why do you pressure can your potaoes at 15 pounds? I have only read it to be 10 pounds. Is it because they are not cooked first? I so much hope your site is still ongoing! As a young poor woman with children, I water canned everything! Never had a problem, only lost a few jars to spoilage. However!!! In energy savings. Pressure canning is the best! You save money two ways here in central TX, you don’t have your stove on nearly as long, and you don’t have all that heat to cool down when your done! My 10# bags must be short, because I only got 6 quarts out of them, but that wouldn’t surprise me, everything is short! A 5# bag of sugar is 4# now, etc, etc. I figure I can save enough in electricity to buy another pressure canner in less than one season. My pressure canner only has the 15lb setting, to keep from over cooking potatoes do i cook less time. What about other veg. I have been canning potatoes for many years, I found that you can do so much with them. I found out to that I need to pressuer can them only 20 minutes otherwise they tend to get mushy. Is 20 mnutes long enough to kill any bacteria????? They seem to keep a long time this way. Course we use them up fast enough that they have no time to spoil. My husband is a meat and potato man. I did not see in any of the correspondence or either I missed it, but, do you put any ascorbic acid or lemon juice in your potatoes before canning them to keep them from turning colors. i do not put anything in my potatoes but a dash of table salt when i am canning them, i peel some, slice some and just cut some with skin on them, but wash them good, the small ones i just wash and put in jar. presure cook them 15 mins. i have been doing this for 5 yrs and they have been great. jd no i do not put any thing but a pinch of table salt and i have done up over a 100 jars this year. I Just realized after preparing my potatoes for canning that the pressure cooker I have can’t be used for canning. I cant’ get my daughters until tomorrow. How can I store my potatoes until then. Well, it looks like your question was posted a few days ago and just showed up in my browser. I hope you found an answer somewhere. I was getting ready to tell you that if you put the potatoes, covered in water, in the refrigerator they would lose some potassium, but they would be saved. i but some in my exyra room which is kept closed and shades down so no sun light gets in, i had so many potatoes that i could not do all them up in one day so we put them in that room it took me a week to get them all done and they were fine, i ended up with 258 jars of potatoes. some sliced for fring and the little one i washed and put in jar whole. theym have all turned out great, but becky i did try the potatoe salad and did not like it maybe i had the wrong potatoe. Becky, I canned some red-skin (peeled) potatoes just the way you instructed. We opened our first jar a couple weeks ago and (after draining), I sauteed them in butter until they were heated through, then tossed in a bit of minced parsley and ground black pepper. The texture was not mushy at all, and the flavor, while not exactly like fresh, was still really yummy. I think the intense heat just caramelizes the sugars in the potatoes a bit and that changes both the color and the flavor slightly, but not to the detriment. I am glad you are enjoying your canned potatoes. We love ours too. They also make the best potato salad too. You can also deep fry them too, like french fries, after you have drained them well. I usually wash them off, and put them in the refrigerator over night before deep frying. Do you have to use fruit fresh or lemon juice to keep potatoes from browning? rachael i have no idea about why your tops did not seal i have always done my potatoes up with in 2 weeks, i put them in a bedroom on the floor, it is a dark room and cool in there, i then do them up as soon as i can, it is all finished by 3 weeks of plowing them up. My family and I are preppers. We will be using our pressure cooker this weekend for the first time. My question is: How much water do you put in your pressure cooker? My mother did this a lot when I was a kid. Unfortunately, being a kid, I always had better things to do! So here is the one question I haven’t found an answer to… When you pack the potatos into the jars – are the jars supposed to be hot – like sitting in the canner in simmering water hot? i put my jars in hot water in sink as i use them up only because i have had a jar brake when i put them in the pot with jar cold also i add hot water not cold that helps also, i only had 2 jars brake on me before i started useing the hot water. Thanks so much for the reply – i still haven’t done them – but they are on my “bucket list” of things to do. ALSO – what is the shelf life of home-canned potatoes? i only have had them for one year, used the last of what i did up last summer in june, i am not sure what self life is, but when i am done mine i do not buy any from store unless i want baked, then i get a small bag, i have even got them loss 3 is just right for my hubbie and me. i don’t keep them more then 3 weeks with out doing them up. P.S. – I LOVE THIS SITE!!!! d seen it sooner. I started canning potatoes last year and always par boiled them first. Nice to know I don’t have to. Also why does a milky film in the bottom of the jars. I find this site qwuite informative and helpful. yes it is the starch, i get it too and all i do is raise the potatoes off to get the film out, just drain the water out of the jar then run clean water back in shack them up and drain water back out that is it. i have been doing this for 5 yrs and thanks to becky i had a very great turn out of vegs for the winter, now i have tried goat meat, i like it and i think i will never go back to hamburg again. also i use warm jars as i found they brake in the water and if you check you paper work with pressure cooker tills you how much water to add. Is it possible that the ‘soft’ potatoes are from pressure cooking at 15 lbs at a low altitude? Usually it is 10lbs. under 1000ft. and 15lbs. over 1000ft. altitude. If I was close to 1000, say 900+, I would probably use 15lbs pressure just to be on the safe side. Is it possible to can sweet potatoes from the raw state? Just wondering…..
has any one canned purple potatoes not purple sweet potatoes just purple potatoes.. If so how and did they lose all their color? I also canned purple potatoes, along with russets and yukon gold, but kept them in seperate jars. The purples lost all their color and I was a bit disappointed. Is there anything I can do to keep this from happening? We will be canning purple, red, russets and yukon gold potatoes this year. which potato will put out the least amount of starch when canned? I usually throw 50 lbs of potatoes in my washing machine. IF they are early or spring, the skins rub off and no peeling! If they are regular, thicker skinned taters, I run them through twice and it really thins the skins, i never peel them now, and if I do I make sure to peel thickly so I can use the skins as a side dish (baked potato skins) No soap and I simply wipe the drum of my machine out with a paper towel. Saves me several hours of scrubbing and peeling. You can wash any harder veggie in the washing machine on delicate or short wash in this manner. i have never heard of this tiffany but i will try it next year god willing i can still do canning. I am going to try your freezing method. If i am going to use red potatoes do i have to peel them? I like the red potatoes with the peeling on but i didnt know if it would make a difference. I cheat on peeling small potatoes. I rinse the field dirt off with a garden hose, put them in the washing machine, using cold water and the longest, most vigorous wash cycle. Most of the peeling will wash off and the taters are ready to can. You need to do this within a week of digging so the peel isn’t set yet. Simply rinse the washer and wipe out with at damp cloth and it’s ready to do laundry again. I did 35 quarts today in the pressure cooker. I don’t think I would put food in my clothes washer. To think of all the dirty clothes and all of the laundry products (detergent, bleach, fabric softener) that goes into the machine it doesn’t seem safe to use it for food items that will go into my body. I think I’ll stick to peeling; it goes pretty fast with a potato peeler. Thanks for the information on canning potatoes. I’ve been thinking about trying this for some time now. How many pressure canners are you ladies using to do 35 qts in a day. I have a fairly canner but it only takes 6 quarts at a time, I tried to see if I could put pints in it also I could only fit 3 pints. The lid didn’t seem to fit just right for me so I took them out. If you have to let the pressure cannner cool completely I can only see canning a max of 12 quarts in a day. can you shred your raw potatoes and can them like potatoes that you half or quarter? donna I have one that holds 6 qts and if I do pts it takes 8 and with small potatoes I leave that way, the reg ones I cut for French fries, sliced for fried potatoes, cube them I am not sure about shredding them but I don’t see why not. Hello, I canned potatoes in a water bath canner, not knowing the correct method. Now I want to reprocess them in a pressure canner. How do I do this. Can I just leave them in the jars, they all have really good seals.? Made my first batch of potatoes.. they were wonderful.. 2 lids buckled but sealed.. we tried one of the jars .. potatoes were great..husband said they were better then the can ones in stores.. of course he knew better ..he had to say that…the canned ones are much better.. good luck all.. DON’T TRY AND CHEAT ON THE PROCESS.. use the pressure canner.. and be safe. hi i tried to can potatoes using a pressure canner.. problem is they have soured now! does anyone know why this could be? or how it happened? i have water bathed for years and never had that problem….. im definately in need of help on this one. please help? way in which through which you say it. You’re making it enjoyable and you still care for to stay it wise. I can not wait to read far more from you. This is actually a terrific web site. Can u hot water bath canned potatoes ? Your blog is Awesome! I FINALLY found the answer to a canning question that I’d looked high and low for, thank you and God Bless! And i have read other canning reciepes for potato where they say to put lemon juice in ur jars is this a need to be thing.Be waiting..
Re: canned potatoes -For those concerned with thier finished product looking milky or “gelling” I have read that blanching your potatoes briefly (2-3 minutes) before you jar them ( and pressure cook) rids them of excess starch which is what causes the gelling. Has anyone tried this and if so, are they too soft for anything but mashed potatoes afterwards? Just curious on which route to take. hi I have never blanched before canning the potatoes, I just raise them off after opening the car to use, I love doing canning. Love your site. I canned potatoes today and 5 out of 6 quarts have lost over half the liquid. Can I reprocess them, skipping the blanching step? O.K, so I’m readying everything that you have talked about or with others. Unfortunately, I am using the old fashion method for canning the potatoes. Budget will not allow for a presser canner. If I understood correctly; 1) cut peel/ or not into cubes 2) fill jar with potatoes loosely 3) fill with boiling water leaving space at top (add salt if you wish) then place on wire rack and submerge for an hour in boiling water. Does that sound about right? First time for me so I want to make sure I’m doing it correctly and not wasting our potatoes we grew. nora, go to good well, gods way or what ever the resell in your area is and get a presser canner also hit yard sales, becky always said she don’t do water bath as it is not safe for potatoes, I have done other veg that way but not potatoes. I have been canning for years and my mother has been canning for over 40 years. We can everything in a cold packer, rather than a pressure canner. I have three pressure canners but by the time you let the water heat up and then time it and then let it cool down so you can open the lid you have added about 3 – 4 hours to your canning time. We can everything, including meat, in the cold packer. I can about 400 cans of various things a year and my mother about the same. If the jar has sealed, we have never had anything go bad or make anyone sick. If the jars don’t seal, you can put a new flat lid on the jar and re-process. I understand there are guidelines, but I believe they go above and beyond what is required. I have gone by experience. Between my mother, grandmother, myself and my friend and her mother, we have over 100 years of experience canning. We all use the cold pack method which is where you cover the jars with at least an inch of water for processing. I do appreciate that you do not peel your small potatoes before canning. I do not either, even though guidelines say you should. Again, some things you have to figure out on your own. Your site has lots of good ideas. We bought organic meat this year and I canned ground beef, ground chicken, cubed beef and cubed chicken. It saves room in my freezer for other meat like steak and chops that cannot be canned. I find your website very interesting. We are 78 and 81 and still have a few head of grass fed cattle and do organic gardening. We have tried to plan for the unexpected. I have canned organic foods and herbs from the garden. I do not, however, know how to can beef or chicken. I do have some frozen and cured into sausages. I am open to any information you can share with me about canning meat. I found your site when I was looking for information to can potatoes. I find your website very interesting and informative. It is good to hear what the younger generation is doing with their lives. Love and God bless.